I returned last week to Nassau in the Bahamas for the Global Financial Summit. More than 100 attendees had the honor of meeting Prime Minister Perry Christie at the opening cocktail reception (thanks to Gaydene McClain for arranging it). Prime Minister Christie spoke for about half an hour on a wide range of concerns, such as illegal immigration, the drug war, the tourist trade and global warming. Afterwards, we all had photos taken with him. 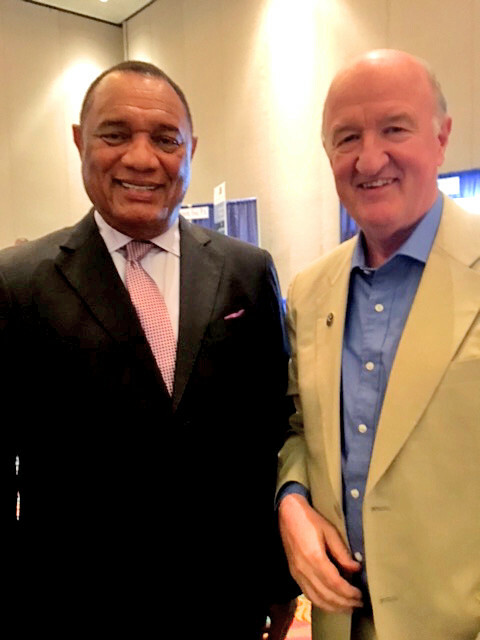 Your editor, on the right, with Bahamian Prime Minister Perry Christie, on the left. However, in talking to local Bahamians, few if any had anything good to say about the head of state. Complaints included the hiring of Chinese construction workers rather than native Bahamians to help build the Baha Mar resort on Cable Beach that is now in receivership, a value-added tax (VAT) that raised the cost of living, increasing crime, sluggish economic growth, high unemployment (now at 14.5%), etc. His administration has been controversial since he pushed through a 7.5% VAT in the Bahamas. He argued that revenues from the VAT would eliminate the nation’s chronic deficits and national debt, now at $6.6 billion. But guess what? The economy and employment are still struggling in the Bahamas, and the budget deficit is still $140 million. The lesson is clear: Increases in tax revenues do not necessarily reduce the debt — they only allow the government to spend more, and, in the case of a VAT, raise the cost of living for local citizens. The Bahamas is a tax haven and attracts wealthy foreigners who reside at Lyford Cay (former residents include Sir John Templeton and author Arthur Hailey, both of whom I met in the mid-1980s). There is no tax on income, capital gains, interest or dividends. But the cost of living is high for all Bahamians due to the high import duties and now the VAT. The tax burden is largely imposed on the poor and middle class. The Bahamas also has imposed restrictions on foreign currency exchange, which is not helping the island grow economically. There is a free-market think tank, the Nassau Institute, in the Bahamas, which I recommend: www.nassauinstitute.org. I applaud President Obama for seeking to open up trade and relations with Cuba. Increasing communications and business with the United States will do more to break down the Communist disaster in Cuba than any blockade will ever do. But when Raul Castro attacked the United States for human rights violations and failure to create economic equality in America, Obama should have fought back. Instead, he just took it. Castro is surely in denial if he thinks Cuba’s economy and its people are better off. Communist policies in Cuba have been a disaster, as anyone who has been to Cuba can attest. Even toilet paper can’t be found for the average Cuban. They may have “free” medical services… if they can get any at all. Here was the perfect opportunity for the press to come forward and name political prisoners. For instance, they could have used this list of 51 political prisoners. Obama could learn from Vice President Richard Nixon in 1959, when he took on Soviet Premier Nikita Khrushchev in the famous “Kitchen Debate” between capitalism and communism. 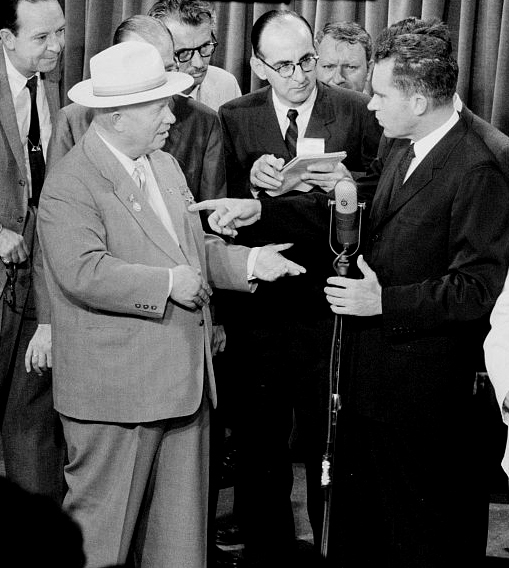 Nixon defended free-enterprise capitalism by showing Khrushchev the latest color TVs in America, proving that Communism would not bury American capitalism. When it comes to presenting America effectively as a land of opportunity where enterprise and innovation are encouraged and rewarded, President Obama falls well short of Nixon, whose 1972 visit to Communist China began rapprochement that restored diplomatic relations between the two countries after 20 years of tension. In our Bahamas conference, the big question was on the surprise ascendancy of Donald Trump as the Republican nominee, and whether he could beat the Democratic nominee (probably Hillary Clinton) and make America great again. Grover Norquist and Steve Moore felt that Trump could beat Clinton, but it would require Trump to unify the Republican Party, which is doubtful. The oddsmakers right now (www,electionbettingodds.com) have Hillary Clinton with a 70% chance of winning the White House in November compared to only 20% for Trump. Marc Faber, the “doom, boom and gloom” forecaster from Hong Kong, thinks that Trump would be good for the U.S. economy and the stock market, but I have my doubts on that. We are going to have a debate at FreedomFest this year (July 13-16, Planet Hollywood, Las Vegas) on “Can Donald Trump Make America Great Again?” Expect a lot of fireworks. We’re getting lots of new registrations every day. Note: You can still get last year’s rates if you register before May 1. Plan now to attend by registering at www.freedomfest.com. Or call, toll-free, Karen, Jennifer or Amy at 1-855-850-3733, ext 202. And be sure to watch our latest video at www.freedomfest.com/videos. In case you missed it, I encourage you to read my Skousen CAFÉ from last week about how the Fed and big business are helping the stock market. I also invite you to comment in the space provided below. Exchange-traded fund (ETf) expert Doug Fabian analyses a fund that looks to profit when an emerging market economy transforms into a more developed one.